We saw some old friends and met some new friends. We talked to a lot of wonderful and generous people and raised a good bit money for 4 Paws. 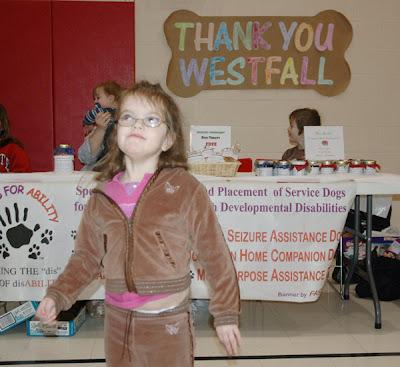 We gave away a lot of free dog treats and people treats as a "Thank You" to our school and our community. We got to say "thanks" in person to some of the people who have helped us so much already. We met Joy the wonder-dog, Alexa the wonder-kid, Ciarra the wonder-sister, and Kristen the wonder-mom. We learned that some wheelchairs have lights on the wheels. We had a couple unplanned wardrobe changes, some broken glasses, a couple naps, and some snacks. We bought some goodies, helped at least one other good cause (the Cure Tays-Sachs Foundation), and our own cause was helped by the awesome Girl Scouts at the table next to us. Amelia and Edson got to play in a big inflatable bouncy castle. Owen got to wow people with his cuteness. Mom and Dad got worn out. And everbody had a good time.